Before we start with a formal introduction to blockchain, let us take you for a moment to a possible future that should realize sooner than we expect. You are on a vacation outside your home country, at a shopping mall and receive a notification saying there is a sale on luxurious watches. You haven’t been to this store before. You pick up a watch and you wonder if the watch is genuine and worth the price. You start a mobile application and place it on the watch. The application recognizes the watch and displays the complete lifecycle of the watch, like where it was manufactured and the GPS coordinates, what parts make up the watch, where it was designed, when it left the manufacturing unit, who was the dealer, custom clearance certificate, what is the warranty period, how much custom duty you need to pay (if any) if you bring this watch back to your home country and even showing and comparing similar watches. You purchase the watch based on these details and now feel even more connected to the watch brand and establish a trust with the shopping store for selling genuine products. Take another example; you need to transfer money overseas, you open a mobile application, provide the beneficiary mobile number and money is transferred instantly. You can even select from the multiple transfer rates from multiple providers, view their ratings and choose one of them. You now have full control on how you can move your money across the globe without any central authority. You are heading back to the airport and receive a message on your instant messenger; the message gets blocked instantly, the messenger classifies this as fake news. You are saved from distraction and later check why the message was blocked. So far, we talked about consumer applications; let’s take an example of a complex B2B process like an international trade finance which currently takes days to complete the trade process. If the entire workflow is automated, self-regulated and equipped with enough consensus between various parties carrying out the trade, it can provide a window of opportunity for new buyers and sellers to handshake, implement and execute trade seamlessly with lot of trust and confidence. In all the scenarios that we described earlier and possibly in all our future applications, data would be a central point for businesses, consumers, and even system interaction. For businesses, data and its state would be used to establish trust and compliance between parties and for optimizing the businesses. For consumers, it would be providing a better experience, personalized engagements and even authenticity of data, be it for news, price or an event. For systems, data would be crucial to establish the trust and compliance for autonomous functionality between devices in a connected world. Now in a data-driven world, you need to establish trust and compliance between parties, you need governance, regulation and accountability through automated workflow and digital contracts rather than central authority and finally a piece of technology that can enable to realize this goal. Once these basic parameters are enabled, it opens endless opportunities to move any value (from services to digital assets) across the network in a secure and transparent way. The technology enabler that can aid in realizing this opportunity is blockchain. We view blockchain as an enabler to provide consensus of data. The consensus can be between business-to-business, business-to-consumer or consumer-to-consumer. We call blockchain an enabler, as blockchain alone will not lead to realizing the opportunities we talked about earlier. The combinatorial power of blockchain, smart contracts, and technologies like IoT & Artificial Intelligence would enable to deliver value-driven intelligent applications. While we described our vision, we are probably at the first generation of blockchain implementation where technologies are still evolving, and use cases are being realized. Through this book, we aim to provide a reference for building any blockchain application. The book comprises of 3 Chapters. In Chapter 1, we start with providing a neutral vision and architecture for blockchain, without getting into vendor implementations. In chapter 2 and 3, we will demonstrate the working of two widely used blockchain implementations – Ethereum and IBM Hyperledger Fabric respectively and build an end-to-end demo using a hands-on approach. The source code for the book is available on GitHub, and all demos can be carried out in a local environment. A vendor-neutral architecture for building blockchain applications. A detailed introduction to Ethereum and its core components. We would set up a local instance of Ethereum and build end-to-end applications on Ethereum blockchain using a hands-on approach. At the end, we would cover topics around extension to Ethereum blockchain, integration with the external world and the future of smart contracts. A detailed introduction to IBM Hyperledger and its core components. We would cover the enterprise capabilities provided by IBM Hyperledger 1.0. At the end, we would set up a local instance of Hyperledger 1.0 and build end-to-end applications on Hyperledger blockchain using a hands-on approach. Our goal in this book is to provide a simplistic view of blockchain technology. The concepts and references laid down in the book will help you to build any real-world blockchain application. Our aim is to keep the book short, relevant, provide practical guidance and enough information to our readers to be productive. 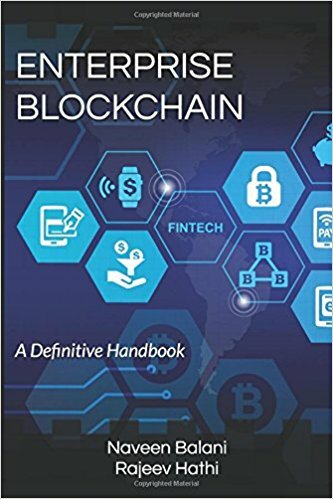 The blockchain book is part of our “The Definitive handbook” series. Our vision in the – “The Definitive handbook” series is to enable our readers to understand the technology in simple terms and provide a go-to reference and a recipe for building any real-world application using the latest technology. This is our second – “Definitive handbook” series work, the first being – “Enterprise IoT” which got acknowledged as one of the Top Computing book for 2016 by computingreview.com (http://computingreviews.com/recommend/bestof/notableitems.cfm?bestYear=2016).